Is your marriage purpose-focused or problem-focused? What is God’s specific BIG IDEA for your marriage? What causes some couples to thrive and others to merely survive (if that) in marriage? 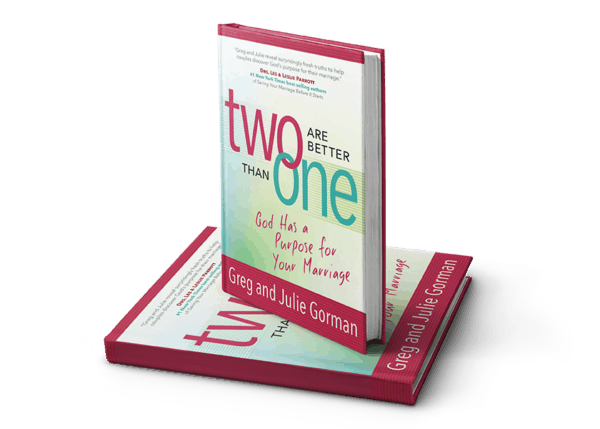 In Two Are Better than One, Greg and Julie Gorman share an irrefutable and exhilarating insight that when fully embraced, by both husband and wife, will heal, restore, and deepen intimacy in every marriage. Yes, in every marriage, no matter the condition of the relationship. You’ll laugh at their fresh twist on some of your favorite Bible heroes and be surprised by a lot of Aha! moments as they provide the pathway to uncover GOD’S BIG IDEA for your marriage leading you on an exciting journey of discovery.